Sparta is one of the most extreme civilizations in Earth’s history. Relatively early in Greek history, even before the Classical World had begun, the Spartans drove through a radical social and political revolution. In effect, all Spartans are made to be equal. Really equal. And they developed key concepts we still use today, like the importance of self-sacrifice for the common good or the value of duties and of rights. In short, all Spartans aimed to be as perfectly human as humanly possible. Every single of our utopic ideas today, can draw their roots from the Spartan example. The biggest problem about Sparta, from a historical point of view at least, is that they left very few written records, and didn’t build grand architecture that we could then analyze. However, Spartan women enjoyed a degree of freedom, education and equality unparalleled anywhere in the ancient world. Each member of society, man or woman, master or slave, had a precise role to play, and one can’t talk about Spartan soldiers without talking about Sparta itself. And this is because every Spartan citizen was specifically molded to be the perfect soldier from birth. This preparation was often-times brutal, and we’ll take a look just how extreme the Spartans were. Almost every aspect of the Spartan way of life was governed by the state. This included its children. Each Spartan baby was brought before a council of inspectors, who examined him for physical defects. If anything seemed out of the ordinary, they would take the newborn and leave him to die of exposure somewhere on a hillside outside the city. In a few fortunate cases, these forsaken children would be rescued by foreigners passing by, or by the helots (Spartan slaves) working the fields. In their infancy, the babies who survived this first of many tests would be bathed in wine instead of water, as to strengthen their physical attributes. They would also be frequently ignored by their parents when they cried, as to make them accustomed to a “Spartan” way of life. These parenting techniques were so highly admired by foreigners that Spartan women were often sought as nurses or nannies. Up until the age of seven, Spartan boys lived with their family, but then they were taken by the state to live in communal barracks and start their first training regimen, called “agoge”. This program aimed to mold the young Spartans to become perfect warriors. The training involved hard physical exercises, as well as learning stealth, extreme loyalty, military and combat training, pain-tolerance, hunting, survival skills, social communication, and morality. They were also taught reading, writing, rhetoric and poetry. However, at age 12 they were stripped of all clothing and possessions, save a red cloak. They were then instructed to sleep outside and make their own beds from reeds. They were also encouraged to scavenge or steal food, but if caught they were severely punished by flogging. Spartan girls continued to live with their families after the age of seven, but they too received the famous Spartan education, which involved dance, gymnastics, as well as javelin and discus throwing. These exercises were believed to make them ready for motherhood. One way through which children were toughened up as a key element in their development as soldiers was to instigate fights among them. Older men and teachers would often start various arguments among their students and encouraged them on, leading the boys to start fighting with each other. Since the main purpose of the agoge was to make these trainees highly resistant to all sorts of hardships found during war, like cold, hunger or pain, those who showed signs of weakness, cowardice, or timidity were subject to harsh punishments and humiliation by peers and teachers alike. Imagine being bullied by someone in school, and then your teacher would come over and join in. To make things even worse, girls often sang choral songs in front of dignitaries during various religious or state ceremonies, sometimes singling out specific trainees for ridicule. Not even grown-ups were spared humiliation. Spartans absolutely loathed people out of shape. This is one of the reasons why all Spartan citizens, the kings included, had their daily meals at a syssitia, a military mess, where the food was bland and always insufficient. Together with daily physical exercises, Spartan men and women kept in shape throughout their entire lives. Those who didn’t, however, were exposed to public humiliation by everyone, and even risked being banished from the city if they didn’t fix the problem immediately. An integral part of Ancient Sparta, and one of its most gruesome practices, was the so-called Contest of Endurance, or Diamastigosis. This tradition was said to commemorate an incident where people from neighboring settlements killed each other at the altar of Artemis. From that point on, human sacrifices were brought there annually. Since Lycurgus, however – a famous, semi-mythical Spartan lawgiver from the 7th century BC – the ceremony at the sanctuary of Artemis Orthia only involved the ephebes (adolescent boys undergoing the agoge) being flogged until they completely stained the stairs of the altar full of blood. During the event, the altar was covered with cheeses and the young boys would try to reach and take them. Older ones would wait for them with sticks in hand, flogging and beating them without mercy. This tradition was in fact an initiation ceremony where the ephebes were accepted as full Spartan warriors and citizens. The last boy standing would receive great honor for his bravery. Deaths were also not uncommon during this event. During the Roman occupation of Sparta, the tradition of Diamastigosis endured, but lost much of its ceremonial importance. It instead became a favorite spectator sport. People from all over the empire would flock to Sparta and see how young men were being whipped in such a brutal fashion. By the 3rd century AD the sanctuary was enclosed by a theater where spectators could watch the floggings. When the ephebes reached the age of 20 or so, those who were marked out as potential future leaders were given the opportunity to take part in the Krypteia. This was a sort of secret police, or at least the closest Sparta got to one. It more closely resembled a guerrilla force since its main purpose was to stake out and terrorize the surrounding helot settlements. At its peak during the 5th century BC, Sparta had about 10,000 men able to bear arms, while the surrounding helot population outnumbered them 7 to 1. This was a double-edged sword for the Spartan citizens. On the one hand, the helots were providing the Spartans with all the food they would need, freeing them to become super-soldiers. On the other hand, the Spartans were constantly under threat from helot rebellions. This continuous risk of revolt was also the main reason why the Spartans developed such a highly militarized society in the first place, in which every Spartan man became a soldier by law. Every fall these young soldiers got a chance to test out their skills, when the Spartan ephors unofficially declared war on the helot population. At night the members of the Krypteia would be armed with knives and set loose onto the surrounding countryside. They were instructed to kill any helot they encountered, especially the strongest among them. This annual slaughter of the lowest class was to ensure the helots’ obedience, as well as to keep their population in check. Only the Spartans who took part in this gruesome event as young men could hope to one day achieve the highest ranks in the army and society. Throughout the rest of the year, this “secret police” would patrol the countryside looking for any signs of unrest. Any potentially troublesome helot would be summarily executed. While this can’t be construed as particularly horrifying, compulsory marriage by the age of 30 is something that many today consider especially frightening. We don’t think the same rules apply in modern-day Sparta, but in the ancient times they certainly did. Up until the age of 30, all Spartan men lived their lives in communal barracks and made up the active military of the mighty city-state. They would then be relieved of duty, but would act as the reserve force until they turned 60. In any case, 30 was the age when all male citizens were more or less forced to tie the knot, if they hadn’t done so already. And since Spartans saw marriage primarily, but not exclusively, as a means of conceiving new soldiers, girls usually married at around 19 (later than other Greek girls). Bachelors were encouraged to evaluate the health and fitness of their future mates. But even if the marriage arrangements were made between the husband and his future father-in-law, this doesn’t mean the girl didn’t have any say in the matter. After all, Spartan women were equal to their men, more so than in a lot of countries today. In the event a Spartan soldier would get married before finishing his active service when turning 30, he would live separately from his wife until that time. Likewise, if a man remained a bachelor after entering the reserves, he was seen as neglecting his duties towards Sparta itself, and would be publicly mocked at every occasion; especially during official ceremonies. If by any chance a Spartan wasn’t able to bear children, he was expected to find a suitable other who could. There were even cases of a woman having several partners and their collective children belonging to all. The bulk of every Ancient Greek army, Sparta included, was the hoplite. These were heavily-armored soldiers, citizens of their respective city-states, with enough material means to equip and make themselves available to fight. But while other cities’ hoplites weren’t professional soldiers and often lacked sufficient military training, Sparta’s soldiers were bred solely for war, and did nothing else their entire lives. And while other Greek city-states built massive walls to defend themselves, Sparta famously had none, considering its hoplites as its defenses. The principle weapon of every hoplite, regardless of origin, was the spear, or dory. These spears measured around 8 feet in length and were held one handed, either over or underhand. Its tip was made out of bronze or iron, and the shaft was made from cornel wood. This wood was especially sought after because of the density and strength it gave the spear. The wood is so dense it actually sinks in water. Then in their left hand, the hoplites held their iconic round shields, the hoplon. Weighing some 30 pounds, these were used primarily for defense, but were also used for bashing. These shields were made out of wood or leather with an outer layer of bronze. Spartans marked their shields with the letter lambda. This stood for Laconia, the name of the region of Sparta. Now, if either their spears broke off or the battle became too overcrowded, the hoplites in the front row turned to their xiphos. This was a short sword, about 17 inches long, which was used for stabbing while behind the hoplon. Spartans, however, mostly preferred the kopis instead of the xiphos, because of the nasty wounds it inflicted. The kopis was used more as an axe in the form of a thick, curved iron sword, and Spartans were often depicted in Athenian art while holding one. For extra defense, they wore bronze helmets that protected the head, the back of the neck, and the face, as well as a breastplate (thorax) of bronze or leather. Bronze graves, knemides, to protect the shins, as well as arm-guards were also worn. One of the signs a civilization reaches a certain point in its development is the way its army wages war. Tribal societies, for example, usually fought in loose arrangements, each warrior waving his huge broadsword or axe over his head in intimidation, and looking for personal glory on the battlefield. But more advanced civilizations fought in compact formations, with each individual soldier having a precise role to play within a larger strategy. The Romans did this, and so did the Ancient Greeks. 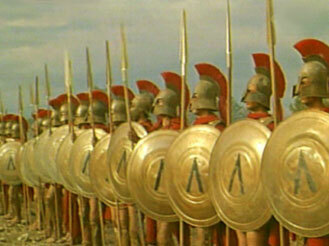 In fact, the famous Roman Legion formations were inspired by the Greek Phalanx. Hoplites were organized into regiments, lokhoi, of several hundred individuals, and fought in 8 rows or more. This is what’s known as a Phalanx. The men stood shoulder to shoulder in a tight formation, with their shields covering their left half, as well as the right side of the soldier next to him. Above their shields and between their heads, there was a literal forest of spears protruding outwards. The Phalanx advanced at walking speed or slightly faster, usually accompanied by rhythmic music and war-cries; something which Spartans studied intensely during the agoge. As Greek cities often fought each other, Phalanx would usually meet another Phalanx in battle, in which case they would push and stab each other until one side emerged victorious. Think of it as a much bloodier version of a rugby scrum. Nevertheless, this formation was also successfully used against the Persians on numerous occasions. Its biggest weakness, however, was its left flank. As the Phalanx advanced and each man sought to keep behind the shield of his neighbor, the formation had the tendency to shift right, leaving the left flank exposed. A good commander would therefore put his best warriors in his own right flank in order to take advantage of this possible situation and ultimately win the battle. As part of their extreme-loyalty training, Spartans despised cowardice above all else, and soldiers were expected to fight without any sense of fear whatsoever. Even to the last man, if need be. In effect, the act of surrender was seen as the epitome of all cowardice. In the highly unlikely event of a Spartan hoplite doing such an unthinkable thing, it would most likely lead him to commit suicide. The ancient historian Herodotus makes mention of two Spartans who missed out on the famous Battle of Thermopylae and who later, in their utter shame, killed themselves. One by hanging himself, and the other by dying a redeeming death during a later conflict for Sparta. Spartan mothers were famous for saying things like: “Return with your shield or on it” to their sons just before they left for battle, referring to them either returning victorious or dead. Sparta only considered its debt fully repaid when its citizens died doing their duty for her. Men by dying in battle, and Spartan women during childbirth. In fact, only these two groups of people were ever worthy enough to have their own names forever engraved on their tombstones. Sparta was known for wanting to spread its own utopian views upon its neighboring states. First were the Messenians to the west, which Sparta defeated during the 7th and 8th centuries BC, turning them into their subservient helots. They later began looking towards Athens itself. During the Peloponnesian War (431–404 BC), not only did the Spartans defeat them, but would also inherit their naval supremacy over the Aegean; something that Sparta never had. Refusing to raze Athens to the ground, as was suggested by the Thebans and Corinthians, the Spartans decided instead to shape the city in their own image. To do so, they installed a pro-Spartan oligarchy in Athens, infamously known as the Thirty Tyrants. Their main purpose was to revise or in most cases, completely erase the fundamental Athenian laws for its own style of democracy. They reformed the power structure by first lowering most citizens’ rights, and installing 500 councilors to serve the judicial functions formerly belonging to all citizens. They also hand-picked 3,000 Athenian men to “to share in the government” who were allowed more privileges than the rest. During their 13-month-long regime, some 5 percent of all the Athenian population died or simply disappeared, a lot of property confiscated, and many pro-Athenian democrats were exiled. A former student of Socrates himself, Critias, the leader of the Thirty, was considered cruel, imposing and downright inhumane, as a man who wanted to make Athens into a mirror image of Sparta whatever the cost. Similar to the Krypteia in Sparta, all people who were considered a threat to the new establishment were quickly executed. They also employed 300 “lash-bearers” to patrol the city, harassing and terrorizing the city’s population into submission. Around 1,500 of Athens’s most prominent figures not in favor of Spartan rule were forced to take poison hemlock. Interestingly enough, the more violent the Tyrants were with the city’s population, the more opposition they faced. This poor state of affairs eventually resulted in a successful rebellion 13 months later, lead by Thrasybulus, one of the few who managed to escape into exile. With the Athenian restoration, the before-mentioned 3,000 were given amnesty, while the rest, the Thirty included, were executed. Critias died in the initial attack. Riddled with corruption, betrayals and violence, the Tyrants’ short rule ensured severe mistrust among the Athenians themselves in the years to come. Made popular today by the 1998 comic book series, and the 2006 movie 300, the Battle of Thermopylae in 480 BC was an epic engagement between the few Greeks under the Spartan King Leonidas I and the many Persians under King Xerxes. The whole conflict began even before these two became rulers, during the reign of Xerxes’ predecessor, Darius I. He already expanded his borders into mainland Europe and then set his sights on Greece itself. When Darius died and Xerxes took power in 486 BC, he immediately began preparations for an invasion; the biggest threat Greece had ever faced. After much deliberation between the many Greek city-states, a combined force of around 7,000 hoplites was sent to defend the pass of Thermopylae against the advancing Persian army. (Somehow the graphic novel and movie failed to mention those other 6,700 warriors, including the legendary Athenian naval fleet.) Among that 7,000 were the famous 300 Spartans lead by King Leonidas himself. Xerxes amassed around 80,000 troops for the invasion, though the numbers vary a lot. The relatively small Greek force was due in part to their unwillingness to send troops so far north. The other reason was more religious, for it was the period of the sacred games at Olympia and the most important Spartan religious festival, the Karneia, during which no fighting was allowed. In any case, Leonidas realized the peril they were facing and chose 300 of his most loyal men, who all had male heirs. Located some 95 miles north of Athens, Thermopylae was an excellent defensive position. Only at about 50 feet wide, and cramped between an almost vertical cliff-face and the sea itself, the Persians couldn’t effectively deploy their vastly superior numbers. This gave the Greeks a tremendous advantage, coupled with a defensive wall already built there. When Xerxes finally arrived, he waited four days in the hopes of the Greeks retreating, which didn’t happen. He then sent his envoys one last time, asking they lay down their arms, to which Leonidas replied “come and get them.” For the following two days the Greeks withstood the many Persian attacks, including those of the infamous Immortals. Betrayed by a local shepherd who told Xerxes about a hidden pass through the mountains, Leonidas would soon find himself surrounded. Learning of this unfortunate turn of events, he dismissed most of the other hoplites under his command, and kept only his Spartans and a few others to make the last stand. When the final attack came, the mighty Leonidas, as well as his 300 Spartans fell, fulfilling their duty towards their people and to Sparta itself. Even to this day, there’s an inscription at Thermopylae which says: “Go tell the Spartans, you who read: We took their orders and here lie dead.” Now even if Leonidas didn’t win the battle, what he did manage to achieve reverberated through the following wars with the Persians, leading the Spartans to lead the resistance and defeat their overwhelming conquerors. This battle also ensured that Sparta will forever be remembered in history as one of the world’s most unique and powerful civilizations.